Looking for a simple risotto recipe? 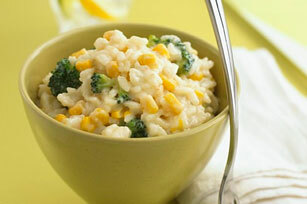 Then try our recipe for Risotto with Corn and Broccoli. Great as a side dish or as a main course. Melt butter in large saucepan on medium heat. Add onions and garlic; cook 2 to 3 min. or until crisp-tender, stirring frequently. Stir in rice; cook and stir 2 min. Add wine; cook and stir 1 min. or until absorbed. Stir in 1/2 cup broth; cook on medium-low heat 4 min. or until most the broth is absorbed, stirring constantly. Repeat until all the broth has been added. (Rice should be tender, but firm. This will take about 25 min.) Add broccoli and corn; cook and stir 2 min. or until heated through. Remove from heat. For added flavour, stir in 2 Tbsp. chopped fresh parsley or basil before serving. Add broccoli to saucepan of boiling water; cook 2 min. Drain, then immediately add broccoli to bowl of ice water to stop the cooking process.